Published: June 12, 2012 at 11:22 a.m. 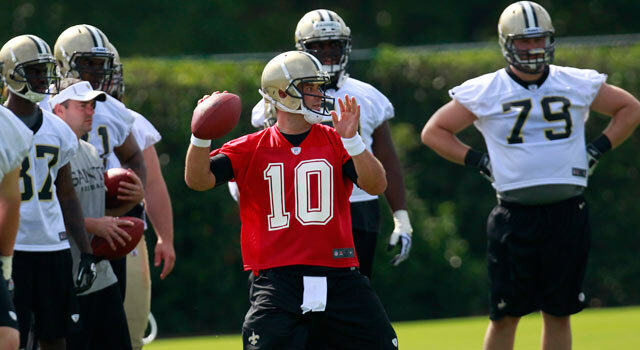 The Saints definitely miss Drew Brees, but Chase Daniel (pictured) is doing an admirable job in a stand-in role. METAIRIE, La. -- One of my favorite things to do is visit minicamps in the spring, after the draft and most of free agency have played out. It's a great opportunity to see how teams are attacking the game differently, how rookies are integrating into the NFL and how the pieces are fitting together in a general sense. This offseason, no team piqued my interest more than the New Orleans Saints. 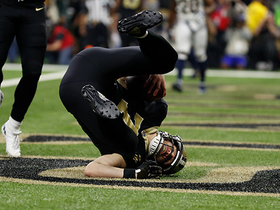 The Saints are the NFL's most embattled team these days. 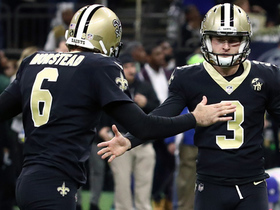 From the bounty scandal to the resulting suspensions to the Drew Brees contract stalemate, New Orleans has become a beacon for drama over the past few months. A lot of folks wonder if this team will crumble under the strain of adversity. Consequently, I didn't know what to expect on my trip to the Big Easy last week and would not have been surprised by a sloppy showing from a depleted coaching staff and dispirited group of players. I observed just the opposite. This is a team that has won 41 games (playoffs included) since 2009 -- including the franchise's first Super Bowl title -- and seems destined to continue this successful run in 2012, despite surrounding turmoil. Spending two days at Saints OTAs, experiencing everything from practice to film sessions with the coaching staff to cafeteria downtime, I saw an extremely focused team that should once again be a Super Bowl contender. 1. The depleted coaching staff's adjusting remarkably well to life without Sean Payton. Bounty punishments took Sean Payton from the Saints for the entire 2012 season (beginning in April). Assistant head coach/linebackers coach Joe Vitt has been tasked with filling in for Payton, but he faces a six-game suspension once the season begins. For now, though, Vitt looks like the perfect man for the job. This is a guy who has spent his entire, 33-year coaching career in the NFL, learning from some of the game's finest figures, including Chuck Knox in Seattle. Although he's never been a full-time head coach, his extensive experience, toughness and brutal honesty allows him to form a strong rapport with players. But he also has a fantastic relationship with the rest of the coaching staff, allowing everyone to perform their respective duties without interference. Despite a brand new coordinator in Steve Spagnuolo, the defense looks very much in sync. After running an extremely aggressive defense based on man coverage under Gregg Williams, the Saints are settling into more quarters (zone) coverage with Spagnuolo at the helm. And the players have responded very well to this change in philosophy, particularly safeties Malcolm Jenkins and Roman Harper, who have both immediately picked up the new scheme. New middle linebacker Curtis Lofton, a man with increased importance due to Jonathan Vilma's season-long suspension, looks 10 pounds lighter from a season ago. Lofton's playing quicker in general and performing better in pass coverage. After observing practice, I joined the defensive staff for a film session and was amazed to see how well the unit's already operating. I was shocked by how few mistakes/corrections were being made. It was not an intense critiquing session at all -- just some tweaks here and there. Spagnuolo and Co. are very well-organized, presenting a clear game plan for a defense eager to improve on last year's lackluster showing. (From 2010 to 2011, New Orleans fell from fourth to 24th in total defense.) The Saints' defense looked above average for this time of the year. Offensively, with Payton out of the picture, this is Pete Carmichael's show. Just 40 years old, Carmichael has the makings of an NFL head coach going forward. He's a very bright, forward-thinking offensive mind. Clearly, this is a completely different team without Drew Brees at the helm, but Carmichael has done a nice job orchestrating the offense with Chase Daniel behind center. The Saints are even incorporating some of the things Daniel excelled with during his college days at Missouri -- half rolls, generally moving the pocket -- as an emergency plan, just in case Brees' holdout continues. All in all, the offense is in good hands with Carmichael. With Spagnuolo, Carmichael and offensive line coach Aaron Kromer essentially vying for a six-week head coaching position (once Vitt's suspension begins), it's easy to imagine this staff fracturing. But that's not the case at all. This is a very cohesive bunch that doesn't have trouble dividing up duties. 2. New Orleans has received enviable player commitment this offseason. As mentioned before, the Saints' contract dispute with Brees is ongoing. But of the players under contract and healthy, the Saints report 100 percent attendance at offseason workouts. The general training regimen has been stupendous. One player who particularly stands out is Will Smith. 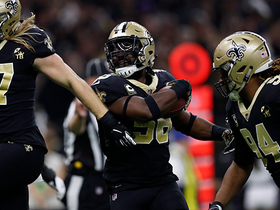 The ninth-year veteran defensive lineman has been suspended for the first four games of 2012 for his involvement in the Saints' bounty system. A lot of times, when players are put in tough positions -- whether they're going through divorce or, in this case, a league reprimand -- they tend to slack off. But Smith has responded by getting in the best shape I can remember since he first entered the league in 2004 out of Ohio State. He performed fluidly in drills and generally looks like a man on a mission. Smith has responded admirably to difficult circumstances -- a common quality on this Saints roster. Instant Debate: Most improved team? Brees received great praise -- and rightfully so -- for organizing Saints workouts during last summer's labor dispute. But he's certainly not the only leader on this Saints roster, so nothing's breaking down in the absence of the franchise quarterback. Smith, Harper and Jenkins continue to carry the torch on the defensive side of the ball, while the offense has a number of true professionals, including running back Darren Sproles, who displays a quiet leadership. This team has a very strong core, which is a godsend with all the distractions that have presented themselves. Through all this turmoil, the Saints have really come together as an organization. 3. The Saints remain focused on the task at hand, not outside distractions. Despite the emotional toll this team has taken, there are no lingering effects from the NFL's unprecedented punishments. Contrary to what many may think, it's not even a topic of conversation around camp. Spending time in the locker room and cafeteria, I didn't hear a single mention of "Bountygate." This team has not gone astray at all. There's no feeling of gloom and doom. Just a group of single-minded players going about their business. On the field, the team's focus was outstanding. During the two days I attended practice, I didn't witness a single false start, offsides or failed QB-center exchange -- three things that can go awry at this time of year. The season's still three months away and the temperature's in the triple digits, but nobody's lollygagging at the back of the line or halfheartedly going through the motions. This team is locked in. 4. Chase Daniel is doing his best Drew Brees impression. One thing I'll always remember from my Cowboys days is how much Tom Landry stressed QB-WR harmony. He thought this was the most important relationship on the entire team, having quarterbacks and receivers annually report to camp three days before everyone else for "Quarterback School." The main focus was to develop proper timing. For this reason, Brees' absence is certainly not ideal. That being said, Daniel looks as close to Brees as you can get for a stand-in. He's worked hard to improve his upper-body strength and throws a very nice ball. Daniel routinely hit the back-shoulder fade that Brees has mastered over the years and reacted well to the blitz. Thus, despite Brees' absence, Saints pass catchers are getting a lot out of these workouts with Daniel at the helm. Daniel's certainly not Brees, but he does a fantastic job playing Brees' role in this offense. Of course, Daniel was involved in a bit of a scuffle with Lofton that drew national headlines. Truth be told, it's very seldom that a day goes by without a little dustup in team workouts -- especially when it's 100 degrees outside. These things happen. And three plays later, I noticed Daniel and Lofton joking around with each other. No big deal. 5. 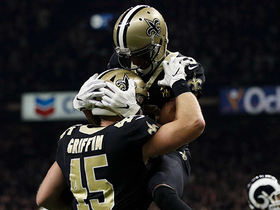 Jimmy Graham displays unlimited upside. No player was more impressive than third-year tight end Jimmy Graham. The former Miami Hurricanes basketball player is still just scratching the surface of his potential. He's unbelievably fluid for a guy who stands at 6-foot-6, 260 pounds, and makes outstanding adjustments on the ball. A lot of people compare Graham to Antonio Gates because of his basketball background, but his body type and smoothness are more reminiscent of Hall of Famer Kellen Winslow. Graham broke through last season with 1,310 receiving yards and 11 touchdowns on 99 catches. This year, I can see him eclipsing 100 receptions. He's that good. We're looking at a perennial Pro Bowler for years to come. The drama swirling around New Orleans this offseason could bury some organizations, but the cohesive effort I witnessed last week couldn't have been more encouraging for the team's prospects in 2012. It goes without saying that everything relies on Brees returning to the team. So long as No. 9 is behind center, though, this team will remain highly formidable in the fall.